The Birmingham Public Library is pleased to host the "Vulcan Performers Go Hollywood" charity event benefiting Magic Moments. The red carpet rolls out at 6:45 p.m. for the arrival of the local celebrities and dancing professionals that will take to the stage for the benefit performance. Cheer on your favorite celebrities such as Tony Kurre from Rock 99/Sports Jox; Charles Daniel from CBS 42; Jay Schotts—Mrs. Alabama Dream; Jesse Palmer—FTW Pro Wrestling Champ; and Envy—local female wrestling champion. Also present will be Chris Sarris—Club 1120 DJ; Rick and Bubba interns Katy Shack, Bama Montana, and Barnes and Stumble. "Vulcan Performers Go Hollywood" is the group's fifth professional show and will feature acts in ballroom, ballet, jazz, tap, hip hop, breakdancing, swing, and more. All acts will feature music from Hollywood movies—classic and contemporary. This is a free event benefiting Magic Moments. Donations will be accepted at the door to support the ongoing efforts of Magic Moments. 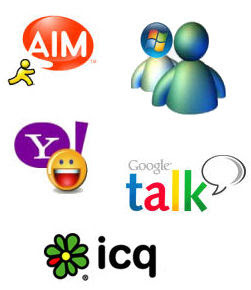 Instant messaging or IM lets you communicate in real time with another person over the Internet. Come learn about this fast, fun way of talking and how easy it is. An extraordinary portrayal of redemptive love, Godspell is a fun, modern-day version of the New Testament parables straight from the Gospel According to Matthew. This Broadway smash hit features impressive music by Stephen Schwartz, including the international hit, “Day By Day,” along with “Prepare Ye The Way Of The Lord,” “All Good Gifts,” and “By My Side.” Using a variety of theatrical storytelling traditions, Godspell is a groundbreaking and unique reflection on the life of Jesus, complete with a message of kindness, tolerance and hope. 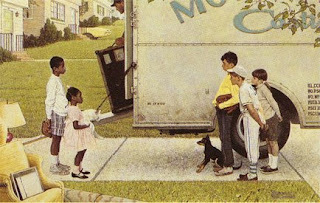 Julius Rosenwald, co-owner and president of the Sears department stores, funded the Rosenwald Schools for the education of rural African-American children living in the early twentieth-century south. 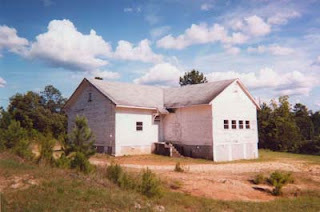 Booker T. Washington approached him about spending some of the money Rosenwald donated to Tuskegee Institute to construct six small schools in rural Alabama. When these schools were opened, Rosenwald was so pleased with the results that he set up the Julius Rosenwald Fund to build more African-American schools throughout the south. Historian and preservationist Dorothy Walker will discuss the history of these schools and today's efforts to save the few surviving buildings. Wednesday, April 30, noon. 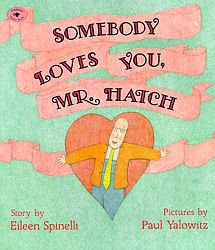 Somebody Loves You, Mr. Hatch by Eileen Spinelli tells the inspirational story of Mr. Hatch who lives a dull, routine, uneventful life. He takes the same route to work, day in and day out. He eats the same boring meal day in, day out. He may have a sandwich and a prune for dessert. He keeps to himself, talks to no one really. You get the idea. Until one day, Mr. Hatch receives a simply terrific surprise, a heart-shaped box of chocolates. Who sent this wonderful gift to Mr. Hatch? He wonders. This box of chocolates makes a spectacular change in the life of Mr. Hatch. He finally receives a gift much more wonderful than he could ever imagine. This book is about giving, sharing and receiving. Often simple acts show that you care, and can make such a difference to those that are lonely and in need. We often do not know the impact we have had on the lives of others. This funny, delightful book delivers an extraordinary gift. Share this book with a child. This is a message that we should emphasize to children. Adults will also enjoy the book and can benefit from its simple yet important message. Explore how writers and artists such as Harper Lee used various media to express their thoughts about the pressing social issues of the twentieth century. Presented by poet Irene Latham and artist Liz Reed. Wednesday, April 23, noon. The Birmingham Public Library will offer “Legal Readiness,” the next class in the popular, ongoing retirement series. Anne Mitchell, Attorney at Law for Baker, Donelson, Bearman, Caldwell, and Berkowitz, P.C., will discuss the ins and outs of the law for those planning on retiring, no matter how close or far away you may be. She will discuss wills and trusts, estate planning, powers of attorney, and other issues. She will go over the key legal terms that you should know before you sail off into the sunset. Look no further! We can help. The Birmingham Public Library now has the Birmingham City Schools’ Accelerated Reader (AR) list available online. The Library has subscribed to “Read the Books” which offers a feature that produces a sortable Accelerated Reader list. What’s great about this feature is that all the books are linked to the Birmingham Public Library’s online catalog. Birmingham City School students, teachers and parents will be able to access school lists from the Birmingham Public Library website and sort by title, author, points, and grade, and then check the catalog. What a timesaver! Spring is definitely in the air. Perhaps you have found yourself having melodious, rambling, romantic thoughts as the temperatures grow warmer. Well, April is National Poetry Month and is the perfect time to add those creative thoughts to paper. There are many fantastic ideas to help you celebrate and inspiration is everywhere. Perhaps you can create a poem, read a poem to a child, analyze an old favorite, compose a haiku, listen to a poetry podcast or read more about your favorite poet. For other ideas, you might begin playing with words that rhyme, look at colorful images, or keep a list of interesting words. Try any or all of these ideas! During your creative journey, please remember that the Birmingham Public Library has many wonderful resources, including databases and books for all ages to help you get started. Come visit the library for a world of ideas and inspiration. Now, get started today and remember most of all, have fun! The most important thing is to let your thoughts run wild! Release the poet within you! Richard Manoske, a Birmingham Public Library staff member, will give an excellent presentation on the art and science of digital photography. The program will be held live at the Five Points West Regional Library and will also be simulcast at the Springville Road and Central libraries. Interested attendees will learn how to take great shots with their digital cameras and learn how to take advantage of all the benefits of digital photography. Mr. Manoske will answer questions from audience members. National Library Week 2008's theme is "Join the Circle of Knowledge @ Your Library." The eloquent Julie Andrews is this year's Honorary Chair. First started in 1958 to turn Americans away from their radios and TVs and back to books, National Library Week celebrates the contributions of the nation's libraries and promotes library use and support in school, public, academic, and special libraries. The hypnotic trance of media entertainment must have been a real concern back in those days since the first year's theme was "Wake Up and Read!" All Jefferson County Public Libraries will celebrate National Library Week once again by offering to waive $5 off accrued fines. This offer is not good for payments on lost or damaged items. BPL and the UAB Department of Supplier Diversity and the Department of Procurement are working together to help small business owners in the Birmingham area. To read more about this partnership, please read the UAB press release below. BIRMINGHAM, Ala. - More and more business today is conducted online, but not every business uses computers. So, the University of Alabama at Birmingham (UAB) Department of Supplier Diversity and the Department of Procurement have teamed up with the Birmingham Public Library to make vendor applications and notices of contracts more accessible to disadvantaged small business owners who don't have access to computers. Through this new partnership, disadvantaged small business owners who are interested in doing business with UAB can now visit one of 20 Birmingham Public library locations to log onto a computer, where they can download the applications needed to enter their bids on contract opportunities at UAB. Disadvantaged businesses include businesses owned by women, minorities, veterans and the disabled. The service is free. Librarians are on hand to help the business owners download and print copies of the forms. This new offering is especially beneficial to small contractors in the construction industry who often do not use computers, said Albert D. Herbert, RT(R), Ph.D., executive director of the UAB Department of Supplier Diversity. "This is a bold step in a positive direction to increase UAB's accessibility to business opportunities in procurement," said Terry W. Justice, executive director of the UAB Department of Procurement. Access forms at http://www.minoritydev.uab.edu/VenderApp.asp. For more information, contact Ken Johnson in the UAB Department of Supplier Diversity at 205-934-8762. The UAB Department of Supplier Diversity was established in 1987 to ensure that all suppliers have access to and knowledge of the university's procurement system. 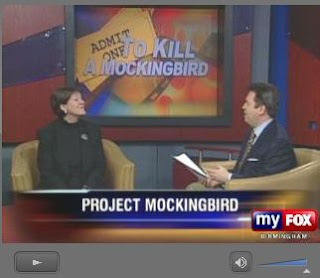 Mary Badham, the actress who played Scout in the film version of "To Kill a Mockingbird" was interviewed this morning on Fox 6 about Project Mockingbird. Click here to see the interview. She will be appearing at the Birmingham Public Library-Central for Alabama Bound on Saturday, April 12. Hope to see you there. BPL archivist Kelsey Bates was interviewed by local public radio station WBHM for the local arts program Tapestry. Below is a desciption of the interview and the link to listen to it online. Roadside stand near Birmingham, Alabama, 1936. 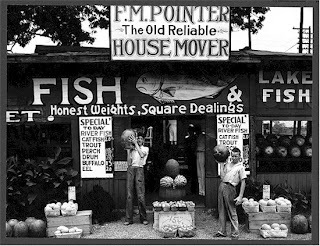 Hear photo historian Frances Robb discuss the remarkable photography of Depression-era Alabama created by Walker Evans, Dorothea Lange, and other American photographers. Wednesday, April 16, noon. 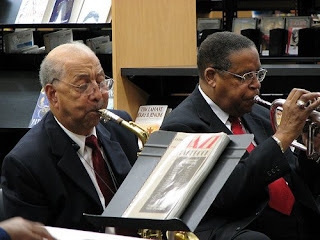 The renowned Birmingham Heritage Band recreates the swinging sounds of the Big Band era. Join us at this most jazzy BPL@Night for a look at the legendary music and performers of the time no one wants to forget. 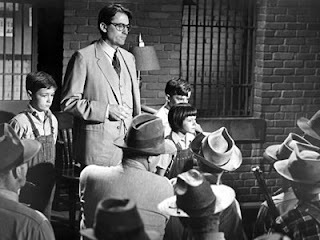 As part of the Big Read: Project Mockingbird, there will be a special showing of To Kill a Mockingbird at the Alabama Theatre on Thursday, April 10, at 7:00 p.m. Special appearance by Mary Badham, who played Scout in the 1962 film. Tickets are $4 per person and entitles the holder to popcorn and a soft drink. Tickes can be purchased at any of the 39 Jefferson County Public Libraries, as well as at the door beginning at 6:00 p.m. Subtítulos en español. The Big Read is an initiative of the National Endowment for the Arts in partnership with the Institute of Museum and Library Services and Arts Midwest. The Big Read brings together partners across the country to encourage citizens to read for pleasure and enlightenment.The Big Read is made possible by grants from the ,Alabama State Council on the Arts and the National Endowment for the Arts. The Public Libraries of Jefferson County would like to thank the Birmingham News, Irondale Cafe, The Daniel Foundation of Alabama, Gratitude Foundation, Hill Crest Foundation, Birmingham Jewish Federation, Birmingham Sister Cities Commission, Regions Bank, and Alabama Power Foundation for their generous support of The Big Read. Birmingham Public Library’s Digital Collections were created to preserve and make available the local history of Birmingham and the surrounding area. This amazing online resource features some of the treasures of the library’s special collections and archives including newspaper articles, photographs, local history, and full-text pamphlets. The digital collections encompass a variety of topics from the familiar to the unusual. Enjoy the collection and come back often as new materials are constantly being added! 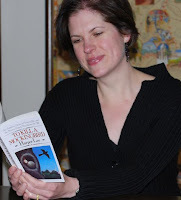 Please join the Birmingham Public Library-Central for Alabama Bound on Saturday, April 12, 10:00 a.m.-3:00 p.m. Birmingham Public Library’s 10th annual author festival and The Big Read will present a day-long series of programs featuring To Kill a Mockingbird. The day will include music, food and entertainment. We will also have Irondale Café lunches. The Big Read is an initiative of the National Endowment for the Arts in partnership with the Institute of Museum and Library Services and Arts Midwest. The Big Read brings together partners across the country to encourage citizens to read for pleasure and enlightenment. The Big Read is made possible by grants from the Alabama State Council on the Arts and the National Endowment for the Arts. Please join us! Books and photographs will be for sale. The program should be an exciting event! 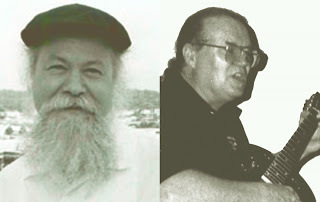 BPL@Night presents Music of the '30s, featuring Chuck King and Phillip McEntee. Join us for an evening of music from the '30s, featuring trumpet and guitar from this special era of our heritage. 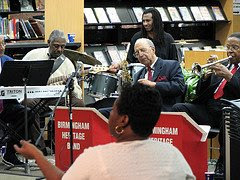 The renowned Birmingham Heritage Band recreates the swinging jazz sounds of the big band era. Join us for a look at the legendary music and performers of a time no one wants to forget. Wednesday, April 9, noon. Photo courtesy of the Birmingham Public Library. Enjoy more library photos on flickr. 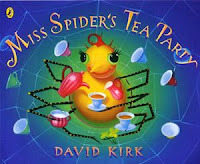 David Kirk’s Miss Spider has made the big time since she first hit the bookshelves in 1994, with a slew of books, an animated series starring Kristin Davis as the voice of Miss Spider (Miss Spider’s Sunny Patch Friends), and a video game. Kirk was a toymaker before becoming a children’s author, and was inspired by his bug-loving daughter Violet to write about bugs. Miss Spider is lonely and wishes for nothing more than for her table to be filled with hot tea, plenty of tea cakes, and good friends. Only problem is, the other bugs fear they might be the main course. The story begins with “One lonely spider wished to play,” and progresses from there as a number of fellow insects are suspicious of the spider’s intentions and flee for their lives. One day she spies a wet, frightened moth and is able to demonstrate her kindness when she dries him off and sends him on his way. The moth spreads the word, and pretty soon Miss Spider has all the friends she needs. The message of Miss Spider’s Tea Party is this: Everyone deserves a chance to show his or her true colors. Miss Spider's ABC is a companion book. If you have children ready to learn their numbers and letters and who also love bugs, these books will serve as fun learning tools. Kirk isn’t just into bugs—he has written books outside the Miss Spider series. He is also the author of the adorable Biddle books, which include Little Mouse, Biddle Mouse; Little Pig, Biddle Pig; Little Bunny, Biddle Bunny; and Little Bird, Biddle Bird. My favorite of the series is Little Mouse, Biddle Mouse. It’s the story of a greedy little mouse who is sent on a mission to find food for his family, but ends up scarfing it all down until his belly pops out. You haven't put food in your food basket yet. Now there's plenty to spare! Why not sample a few? The Coen brothers' No Country for Old Men is about three men: one good, one bad, and one falling somewhere in between. It’s about reminiscing of a time when a town could be watched over by a sheriff who didn't need to carry a gun, and living in the present where a man is emboldened to take a life on the toss of a coin. Blue collar welder Llewelyn Moss (Josh Brolin) is out hunting one day when he spies through his binoculars the results of a drug deal gone wrong. In a suitcase of money he sees the perfect opportunity to escape the trailer-park life he shares with his wife, Carla Jean (Kelly Macdonald). It's a win-win situation: there’s no way to trace the money to him. But his sleep is troubled by a dying man’s wish, and he makes a “dumber 'n hell” early-morning decision that invites a load of trouble into his life in the form of Anton Chigurh (Javier Bardem), a psychopath who leaves corpses all over town as he tracks down Moss and the money. Ed Tom Bell (Tommy Lee Jones) is a weathered, defeated sheriff who is concerned by the escalating violence he witnesses in the line of duty. He chalks up the decline of civilization to the absence of manners: “It starts when you begin to overlook bad manners. 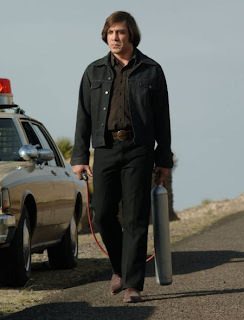 Anytime you quit hearing “sir” and “ma’am,” the end is pretty much in sight.” He convinces himself that he’s not afraid to confront evil like Chigurh, but at the same time he doesn’t want to push his luck. At one point during the manhunt he acts on a hunch, and breathes a sigh of relief when he’s proven wrong. He never seems too bothered by the fact that he’s always one step behind the man he’s chasing; he confesses to his uncle that he feels "overmatched." I've never before seen a menacing haircut on a person, but the swarthy Chigurh sure sports one. Nothing good happens in any scene he’s in, and he proves what a resourceful maniac he is by carrying around an air gun that serves the dual purpose of killing with one shot to the head and blowing locks off doors he wants to get through. He is described by a bounty hunter (Woody Harrelson) as a man of principles who is as dangerous as the bubonic plague, and at the end of the movie we see that he is also a man of his word. No Country for Old Men won Oscars for Best Picture, Best Director, Best Supporting Actor (Javier Bardem), and Best Writing-Adapted Screenplay. The screenplay was adapted from Cormac McCarthy's book, No Country for Old Men. In 2000 his novel All the Pretty Horses was turned into a movie starring Matt Damon and directed by Billy Bob Thornton. His latest novel The Road is in pre-production, and may star Viggo Mortensen or Guy Pearce as the father. Director Ridley Scott's version of Blood Meridian is tentatively planned for a 2009 release. Enjoy the readings from two of the most significant sections from To Kill a Mockingbird? This PowerPoint presentation gives a general introduction to e-mail, explaining the basic aspects of addressing and features found in most e-mail systems. 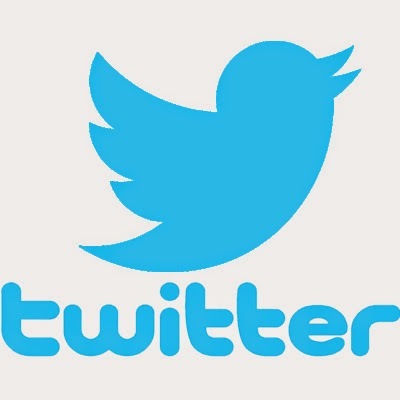 It is mostly designed for people who have little or no experience in using e-mail. 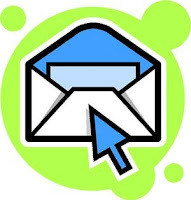 Participants will learn the steps for applying for an e-mail account using Hotmail.